The Trinity Long Room Hub is the institute for Arts and Humanities at Trinity College Dublin and it is dedicated to promoting and facilitating innovative research across its nine partner Arts and Humanities Schools. 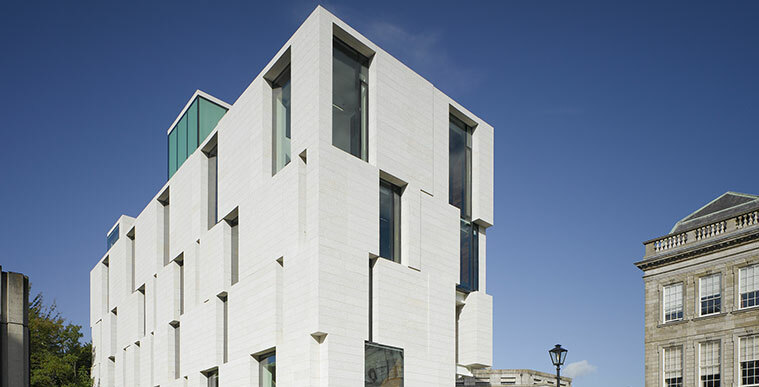 The Hub is located in a state-of-the-art building in the heart of Trinity College and it aims to cultivate an experimental and provocative intellectual space which acts as a catalyst for conversations and collaborations on high quality, high impact and high profile interdisciplinary research. The Trinity Long Room Hub provides the intellectual space for Trinity’s Arts and Humanities scholars to collaborate and hosts a wide range of Public Humanities engagement activities. Since its opening in 2010, the Hub has built an international reputation for agenda-setting scholarship. This has been recognised by grants from supporters including the Andrew W. Mellon Foundation, EU Marie Curie Research Fellowship Programme and by individuals, such as the philanthropists Terry and Marjorie Neill, who wish to see independent, exciting and world-class research flourish. The Trinity Long Room Hub provides a dynamic environment to support our Arts and Humanities research community. Advancing this agenda has many facets: addressing broader societal challenges, asking original questions, instigating new conversations, forging novel collaborations across the public and private sectors, pioneering innovative methodologies for cross-disciplinary discovery, and showcasing research results. Today, the Hub seeks to consolidate its achievements and harness the synergies opened up by its research themes, by securing support for its International Visiting Research Fellowship programme and Public Humanities activities. The Hub also relies on unrestricted gifts from individual donors and foundations to support and promote research in historical, philosophical, literary, and artistic fields, as well as interdisciplinary work between the humanities and other areas such as computer science and law. Our ambition is that our financial support will have a multiplier effect when scholarship, teamwork, engagement, energy and communications come together. The Trinity Long Room Hub has developed an exciting investment opportunity that will facilitate the expansion of the Visiting Research Fellowship Programme and help the Hub attract scholars who are world leaders in their fields. You have the opportunity to sponsor an International Visiting Research Fellow, who will be a scholar of international renown, to come to Ireland and spend up to three months in the Hub for a short-term, high-impact residency. These Visiting Fellows establish fruitful, cross-cultural connections with our academics and students by giving guest lectures; participating in symposiums and conferences in their areas of expertise; and by carrying out joint research projects with Trinity colleagues. The Hub’s Public Humanities Programme is wide ranging and diverse. We host an array of events, from international symposia, public lectures and debates that bring prominent visitors to Trinity and are designed to draw attention to issues of national and international importance. All public events are recorded and podcasts are available on the Hub’s website, which is attracting a growing audience from all over the world. The Trinity Long Room Hub offers supporters the opportunity to sponsor a signature event e.g. a named annual lecture, public lecture or a lecture series. The Trinity Long Room Hub Annual Fund is an opportunity for you to give an ‘unrestricted’ gift to help the Hub achieve its goal of cultivating an experimental and provocative intellectual space which acts as a catalyst for conversations and collaborations on high quality, high impact and high profile interdisciplinary research. Philanthropic support for the Trinity Long Room Hub can be spread over a number of years, and donations can be timed to suit your financial year. Donations are eligible for full tax relief in Ireland, the UK and the USA. The Trinity Long Room Hub provides philanthropic supporters with a number of benefits, which can be tailored according to your interests. Sinéad Pentony, Associate Director, Trinity Development and Alumni, Trinity College Dublin.